Rachel Anderson, a color guard captain of the Blue Knights, was awarded this year's George Zingali Scholarship Award at the DCI World Championship Semifinals on August 8. The 22 year-old has been marching as a member of the Blue Knights for four years. "I was very surprised when I found out I won the scholarship," said Anderson. "They told me I was just going to do some kind of interview on the field, so I wasn't expecting this at all. But I'm really happy." Anderson is currently attending the University of Colorado Denver, where she studies elementary education. She is scheduled to graduate in a year and a half and will use the scholarship toward her tuition so she can begin teaching others as soon as possible. She believes being a member of the Blue Knights organization has inspired and helped prepare her to take on this very important career. "I love the Blue Knights," said Anderson. "I've learned a lot in this corps, and I'm glad I could age out here with them." The George Zingali Scholarship is presented annually to an outstanding World Class color guard captain. The individual must be nominated by his or her corps director and receives a cash award. The award is sponsored by the George Zingali Scholarship Committee. George Zingali was inducted into the DCI Hall of Fame in 1991. 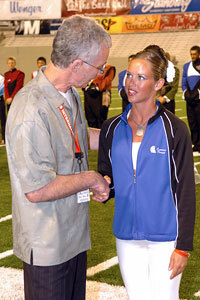 He is frequently hailed as a creative genius instrumental in the development of visual design in both Winter Guard International and Drum Corps International, working with the 27th Lancers, Garfield Cadets and Star of Indiana on the drum corps field and St. Anthony's of Revere, Quasar, and Emerald Marquis in the winter guard activity. The George Zingali Memorial Fund, which supports the scholarship awards, was formed soon after Zingali's death in 1992. George Oliviero, chairperson of the George Zingali Committee, which chose the scholarship award winner, presented the award. Photo by Jolesch Photography.